Self-pity means a self-indulgent dwelling on one’s sorrows or misfortunes, according to the dictionary. Sorrow, on the other hand, is mental suffering or pain caused by injury, loss, or despair. I have learned through the years that to have a healthy Self Esteem I have to know the difference between sorrow and self-pity. If you want to get out of the victim trap, you must be aware of this differences. I remembered that when my father found he had cancer I kept thinking about my misfortune and pain. I kept telling everyone a hidden message: “Poor me, my dad is dying, and I cannot do anything about”, and so on. With this attitude I was not helping anyone. Instead I was manipulating everyone through victimhood and self-pity. With self-pity you live paralyzed, it keeps you in a helpless situation. You are not responsible for your life. You believe that you are a victim of events, and you deserve condolence. It is a negative emotion that prevents anyone to deal with adverse situations. 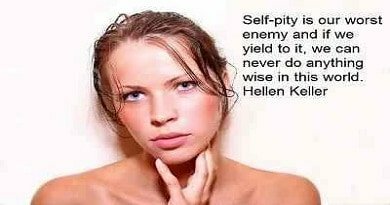 Self-pity becomes a form of manipulation that you might use to get things from other people. position to cope with life events. If we keep dwelling on self-pity, we will dis-empower ourselves, living in constant denial. So, in short, is the “poor me” and it always lays the blame for your problems on some outside entity. Nothing every goes right for you, and yet you are rarely to blame for that. To see if you are suffering from a victim mentality, observe your stream of consciousness and habits for a little while. Now, ask yourself if you habitually find answers to the following five questions whenever things go wrong for you. There is only one correct answer to all of these questions. And you probably aren’t giving it. The right answer is, “Because I don’t take responsibility for causing most of my problems.” If those five questions always go through your head, and you never blame the man in the mirror, you suffer from a victim mentality. Why do other people do me wrong all the time? How could anyone say this is my fault? Why didn’t I have the time? Why don’t I ever get what I deserve? The problem with a victim mentality is that it is very often rooted in a real situation where you were slammed by unfortunate circumstances, or you were done wrong by another. But that time is long since dead and gone; yet you have chosen to respond to all obstacles in your path or all misunderstandings or disagreements between you and another in the context of that dead and gone time. Thus, you have become delusional. Negative thinking. You see everything getting worse and always expect the worst, and this in turn very often transforms into a self-fulfilling prophecy whereby you aid and abet yourself in crimes against yourself. If you are having difficulties with this, you can read more about how teachers to stop negative though teach you a model for assessing the effects of your negative thoughts and changing them, plus it helps you on an unconscious level by showing you how to let these thoughts drift by without taking any notice . Low self esteem. You wish, of course, to get all that you “deserve”. But somewhere in your emotions, you strongly feel that you really DON’T deserve these things you wish for. This is quite often guilt about something. But when you feel guilty it is not your “sins” that you hate; it’s your self. Co-dependent behavior. You have become attached to another person who really does abuse you, but they also know how to play upon your weaknesses and thus they “confirm” your worst feelings and fears about yourself or life. You, in turn, give them energy from yourself that they never earn because you believe they signify “what’s real”. This often is the case in a bad marriage that one or both people remain in. Begin by building self esteem, It is a wonderful feeling to be reminded of your good qualities; one that can carry you through difficult times, improve your a confidence and make you feel more sure of yourself. You will need to re-condition yourself to feel that you deserve what you wish for. The best way to start with doing this is to get more involved in something that you know for a fact you are good at, no matter how “small” it is. Also read books and practice what they tell you are ways to success, no matter how difficult they are at first. Take assertiveness training to begin to stand up for yourself. Once you learn how to stand up for yourself and able to say what’s on your mind clearly , others will give you more respect and consider you capable of more responsibility. We have to stop thinking that being a victim is a victimless crime. Don’t be a victim of yourself. I want to say thank you for this interesting article! =) Peace, Joy. Tiexbaigobe.